Morning Journal/Jo Ann Bobby-Gilbert Sharen Cope thanks a veteran as she hands him a hand-made quilt in recognition of his service. 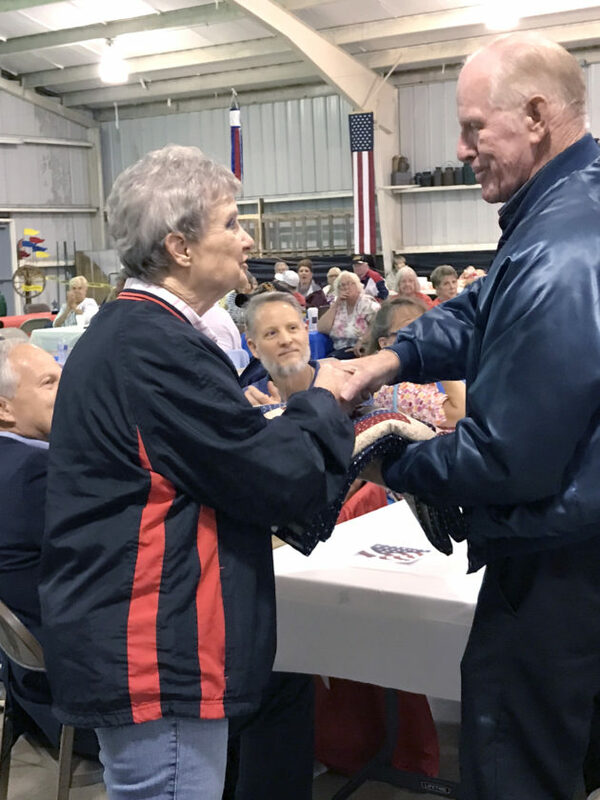 LISBON — A record number of veterans was recognized Sunday during the Columbiana County Fair Board’s service commemoration at the fairgrounds, where an appreciative audience heard from those to whom sacrificing everything is more than just words. Each year, veterans who are nominated by friends, family members and others are recognized and presented with patriotic quilts made by individuals and 4-H groups. This year, 53 quilts commemorating the theme Let Freedom Ring were given, which was the most ever, according to Sharen Cope, one of the original creators. A wide range of military service was noted during the event, with special recognition given to three World War II veterans in attendance: Hank Allenbaugh, of Salem, who was participating as part of the Salem Amvets Drill Team; Nora Eaton of East Palestine, who was a WAC in the U.S. Army, where she delivered the mail at Patterson Air Force Base; and Hobert Yeager, a former U.S. Army sergeant in the 21st Infantry, 24th Division who was wounded on Pinampoan Ridge and received a Purple Heart. A round of “Happy Birthday” was sung to Yeager in honor of his 94th birthday today. Vietnam veterans in attendance were given Department of Defense pins provided through the Wellsville Veterans Memorial Council. Serving as master of ceremonies, Don Humphrey Jr., ex-officio of the fair board, fired up the roomful of veterans and their supporters with his welcome, referencing the day’s football game between the Pittsburgh Steelers and Cleveland Browns, saying, “I don’t care how much of this crowd are Steelers fans, and I don’t care how much of this crowd are Browns fan, but I decided last year until they learn to stand up for the National Anthem, I’ve got better things to do,” bringing loud cheers and applause. Gold Star Mother Chris Wortman created a more somber mood with her keynote address as she spoke of her son, U.S. Army Sgt. Robert Carr, killed March 13, 2007 at the age of 22 by an IED while on duty in Baghdad. She talked of becoming a Gold Star Mother, “one organization no military mom wants to become part of,” saying her son was only 10 days away from coming home when he was killed. Wortman’s oldest son, Matt, has completed 10 combat tours in Afghanistan and one in Iraq, receiving the Purple Heart and Bronze Star, while her daughter, Jennifer, is in the U.S. Air Force, stationed in Arizona after having completed a tour in Kuwait. In addition to the 51 veterans who received quilts, two area first responders were recognized with quilts as well. East Liverpool police Chief John Lane accepted a quilt with his wife Lori and children in attendance, while West Point fire Chief Wayne Chamberlain’s quilt was accepted on his behalf by department EMR Doug Fonner and EMT/firefighter Beth Fonner. Doug Brannon, commander of VFW Post 892 in Salem, announced each quilt recipient and also recognized those groups and individuals instrumental in making the annual event possible. The Amvets Drill Team gave a gun volley and provided the playing of Taps.